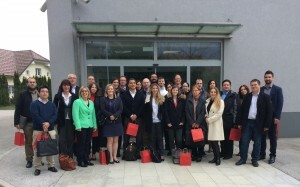 The OptiNanoPro consortium met for the M6 project meeting in Slovenia. It was the occasion to review the plan for the introduction of nanotechnology in the different production lines and the first experimental results. In addition, the partners visited the facilities of TUBA and SIBO that will be “nano-enhanced” respectively to obtain laminated and injected packaging.